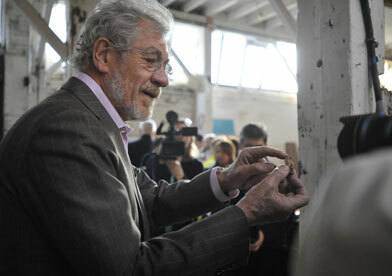 Actors Sir Ian McKellen and Paul McGann were among the visitors last week to a disused warehouse in Shoreditch. 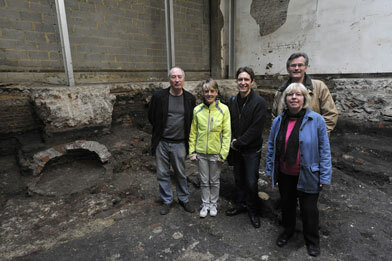 They had come to see the site where Museum of London Archaeology recently uncovered further remains of what is believed to be The Theatre, London’s first purpose-built playhouse. The visitors were shown the remains of what are believed to be the foundations of the inner wall of the polygonal theatre. They also viewed the sloping gravel surface butting up against the inner wall; it is thought that this is the remains of the yard, where the audience stood. The actors were delighted to be standing in the location where Romeo and Juliet almost certainly received its premiere. Paul McGann said it was an experience he would never forget. The Tower Theatre Company, one of London’s leading non-professional theatre organisations, plans to build a new theatre on the site. 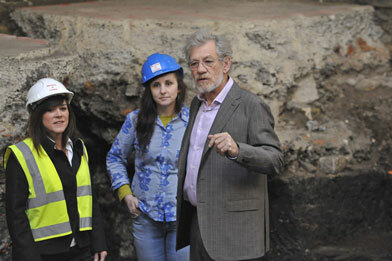 It is hoped that the planning process will begin in April 2009, with the theatre ready to open in 2012.